From Dr. Joe Parent, noted PGA Tour instructor and best-selling author of Zen Golf: Mastering the Mental Game, comes a new book of simple yet powerful techniques for success in golf's game within the game: putting. In chapters such as "Already in the Hole", "Stop the Bleeding", and "Turn Knee-knockers into Tap-ins", you'll find the insights and methods that will help you take your putting to the next level, with more consistency, less frustration, and lower scores. Using his distinctive blend of sports psychology, Zen wisdom, and practical golf instruction, Dr. Joe Parent shares the lessons and practice exercises that have dramatically improved the putting of PGA professionals and amateurs alike. 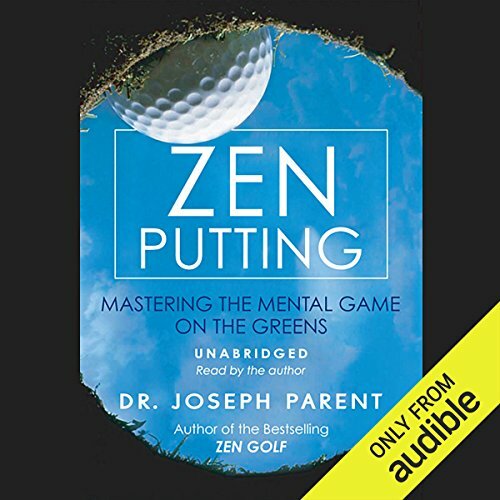 In clear, concise chapters, Zen Putting covers everything from warm-up and practice programs to the ideal routine for setting up to and executing a putt. You'll discover how to synchronize body and mind to make your smoothest stroke time after time and build your confidence round after round. Zen Putting brings a fresh perspective to the art of putting, leading golfers to the effortless focus and confidence of being in the zone, the feeling that they can make every putt they look at. It is a book all golfers will want to listen to again and again. I practice Zen more that I do Golf, but I found that the teachings in this book helped in both disciplines. 6 sur 8 personne(s) ont trouvé cet avis utile. This is the second time I have listened to Zen Putting. Thank you for publishing this book. It was a nice compliment to Zen Golf, but the details are very helpful, thanks! What did you love best about Zen Putting? The additional yet enlightening guidance for calming the mind was beneficial. I am not much on technicalities, but the instruction provided have been helpful to my game. What was one of the most memorable moments of Zen Putting? For me, the memorable moment was realizing that I do not have to take myself nor the game of golf too seriously which provided a release. Have you listened to any of Dr. Joseph Parent’s other performances before? How does this one compare? I would have like listen in one sitting. However, i realized that doing so was overmuch. I enjoyed it over several days; then I returned to it over and over. It is possible to putt your best, this book will show you how. A must read for golfers of all skill levels. Joseph parent continues to deliver on the subject of Zen golf. If you have any issues on the golf green, and who doesn't, this book is a great aid to you. Don't look for technique help but rather look for help on how to think your way a round a green and putting the ball in the hole. Great listen if you want to separate yourself from the crowd. This book is an eye opener. Most golfers tend to start off to golf the wrong way. It should be started from the putting green, something I learned from Dr. Parent. I for one will be listening to this while putting and working on my short game. This book is amazing. If you could sum up Zen Putting in three words, what would they be? What did you learn from Zen Putting that you would use in your daily life? I've listened to Zen Golf so many times and wondered if there would be too much overlap and there was not. Excellent audiobook.